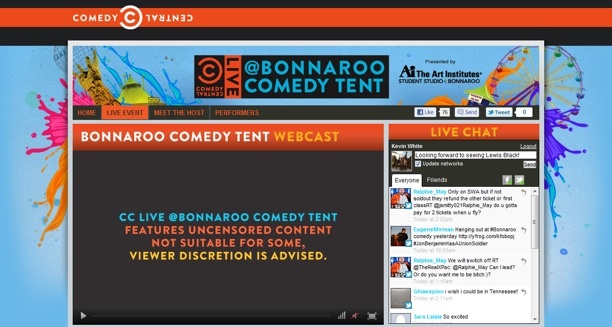 In 2011, Comedy Central presented a live online look-in at the comedy tent from the Bonnaroo festival. This summer, the cable channel will package the best stand-up comedy from Bonnaroo for an hour-long special, to premiere June 23, 2012. The announced lineup for Bonnaroo 2012 so far includes Aziz Ansari, Steven Wright, Marc Maron, Brian Posehn, Reggie Watts, “World Champion” Judah Friedlander, Rhys Darby, Colin Hay, Garfunkel & Oates, Amy Schumer, Pete Holmes, Rory Scovel, Mike O’Connell, Ali Wong and Kyle Kinane. Who will make the cut for Comedy Central? Tune in to Comedy Central Live at Bonnaroo (working title) at 11:30 p.m. ET/PT on June 23, 2012. The Bonnaroo music and arts festival happens in real life from June 7-10, 2012, in Manchester, Tenn.